Island Weddings - Island Romantic! Brides are becoming more creative and demanding. They are more discriminating in taste and focus - they know what they want. Since brides are the chief wedding planners of their own wedding, it is their view of what they want that is most important. As they plan their weddings, their focus is on what theme would be the most memorable. As a result, island locations weddings are becoming more and more popular. A smaller guest list which means that those included are likely to be your closest friends and family. These are the most meaningful people in your life. You can plan some meaningful activities that you wouldn't plan if the wedding was a larger event. For example, you might plan a small party night with those close friends in your hotel room, villa or cottage. On the other hand, you may not! You may want an more intimate situation. You can have your guest list as small as you like - you can even limit it to 2, 1, or none. Witnesses can easily be provided for you. Many brides like to have their weddings at the seaside. Island beach weddings provide the perfect locale for this. The Caribbean Islands add an exotic flavor to the proceedings. An additional benefit to island weddings is that you don’t have to travel anywhere for your honeymoon – You are already there! You can plan your honeymoon activities just to include your selves - just the two of you or you can choose to include your wedding party. They, too, are already there! 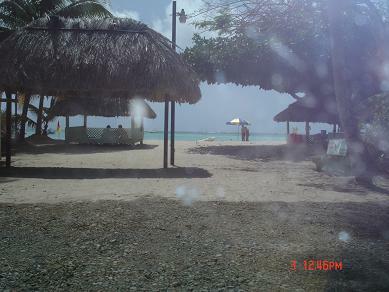 One of the most romantic island weddings location is Tobago. It is the smaller the twin island nation of Trinidad and Tobago. Its beauty is legendary! Its beaches magnificent! Its people welcoming! Your choices are many! You can plan some water activities in the day followed by a romantic evening at some secluded lovers hideaway. Other pre-wedding or after-wedding activities can include guided tours, water sports, excursions on land or water and numerous other activities . At the wedding there are also many ways to incorporate the location into the ceremony itself. For example you can have your wedding at the beautiful Botanical Gardens which is teeming with radiant tropical flowers that radiates as brilliantly as the tropical sun. Then five minutes away, there is access to the most exotic beach settings. As a non resident of Trinidad and Tobago, to get married on any of the two islands some requirements have to be met. NOTE: Any document that is not in English must have an notarized English Translation. If you need help in planning your wedding in Tobago, we can help. It can be all inclusive or you decide how much you want us to do. It can be as formal or as simple as you like. If you can think it, we can plan it! We can plan your entire wedding, from your hotel, villa or guest house reservation, to your ceremony, reception, and your honeymoon activities. Let us help you. Let us prepare an island wedding packages that is worthy of your wedding day. Let us help you make memories that will last a lifetime. Tell us what you want in the form below. Be as detailed as possible. However, please be realistic with your budget plan and guest list.